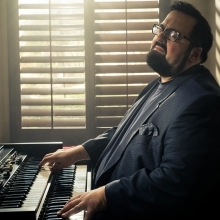 Joey DeFrancesco has stretched himself regularly throughout the course of thirty-plus albums. Just since Project Freedom(Mack Avenue, 2017) he's collaborated very productively for two albums with the Irish soulman Van Morrison—You're Driving Me Crazy (Sony Legacy, 2018) and The Prophet Speaks(Caroline, 2018). And, on In The Key of the Universe, the organist/trumpeter reaffirms his connection with jazz history through fruitful work with estimable musicians including saxophonist Pharoah Sanders and drummer Billy Hart. DeFrancesco himself sounds effortless as he applies a light touch in play on "Inner Being," but that approach extends to the collective, incorporating the solid rhythmic presence of percussionist Sammy Figueroa. "Vibrations in Blue" is suitably atmospheric, but the ensemble swings nonetheless: on this record, metaphysics are no less important than the earthy side of life. Accordingly, the droning of sitar for the intro and outro of that latter cut resides right next to the high-stepping excursion that is "Awake and Blissed; " as with its surrounding tracks, the musicians are so fully engaged the visceral impact of this music equals the cerebral. "It Swung Wide Open" continues at a similarly fast pace before DeFrancesco and company, including Troy Roberts, the saxophonist for his own band, embark upon deeply spiritual excursions at the heart of this album. For the title song and "The Creator Has A Master Plan"—on the original thirty-two plus minutes of which Hart accompanied Sanders—the instrumental excursions are curtailed somewhat), but the playing time most certainly does not belie the depth of passion. 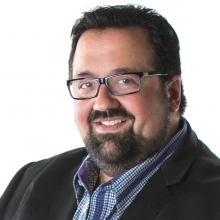 A comparably novel effect arises from DeFrancesco's trumpet playing on yet another aptly-named title here, "A Path Through the Noise," where his horn lines dances around the subtle beats of Figueroa. Likewise, Roberts cements the emotive power of his own playing when he appears so prominently in sequence, on the ever-so-lush "And So It Is" and "Soul Perspective," hardly residing in the shadow of his iconic counterpart, he simultaneously broadens the scope of In The Key of the Universe, deepens its accessible quality and reaffirms this record's continuity with Joey DeFrancesco's body of work at large. Track Listing: Inner Being; Vibrations In Blue; Awake And Blissed; It Swung Wide Open; In The Key Of The Universe; The Creator Has A Master Plan; And So It Is; Soul Perspective; A Path Through The Noise; Easier To Be. 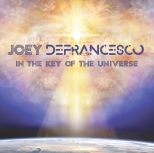 Personnel: Joey DeFrancesco: organ, trumpet; Pharoah Sanders: tenor saxophone, vocal; Troy Roberts: soprano, alto and tenor saxophone, bass; Sammy Figueroa: percussion; Billy Hart: drums.